The following study will analyse and compare the contemporary photographers- widely known for their conceptual portraits- American Cindy Sherman (b. 1954) and Senegalese Omar Victor Diop (b. 1980). The works selected are Albert Badin by Diop and Untitled (Self-Portrait with Sundress), both of which feature a persona explored through self-portraiture and conceptual portraiture. Thus, the works go in hand with my theme of identity. Cindy Sherman studied visual arts at university, focusing firstly on painting before later working with photography, which is now her most prominent medium. Sherman is one of the most respected photographers of the late twentieth century. The majority of her photographs are self-portraits, each featuring a feminist element which challenge the representation of women in society and media, as well as American popular culture. Hence, her works are a vehicle for commentary on contemporary American society. Omar Victor Diop studied at the Business School of Paris and worked in communications before concentrating solely on photography. His most famous series is Diaspora (2014) featuring staged self-portraits inspired by Spanish portraiture of the 14th and 15th century. It explores the identity of modern Africans and the role of African history, culture and heritage in the formation of such. Thus, his works explore the interconnectedness of collective and personal identity. Note: Diop’s name is both correctly spelt as Omar Victor Diop and Omar Viktor Diop. In this study, the former will be used. Diop’s series Diaspora– meaning the dispersion of people from their original homeland-was first exhibited in 2014. The series appropriates Spanish portraiture of prominent African figures who experienced African diaspora in the 14th and 15th century, with Diop as the subject. Diop produced this series while residing in Spain, during which he experienced cultural alienation. In recreating portraits of famous Africans who were alienated in the most extreme sense in Europe- experiencing racism, mocking, and complete abandonment from society- Diop conducts a personal search for both his own identity and the collective identity of Africans in Europe. The work investigated in this comparative study is Albert Badin (medium), a recreation of a historic portrait by Gustaf Lundberg. Badin- originally named Couchi- was born in 1747 or 1750 in either Africa or Saint Croix before being forced into slavery. 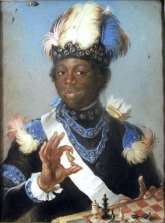 Badin- meaning trickster– was treated as a noble savage and permitted to work as a Swedish court-servant and butler of Queen Luisa Ulrika of Sweden. Badin was also a diarist and a fond member of the Swedish courtly life. As with the other figures in the Diaspora series, Badin- as stated by Diop- “did not fulfil the usual expectations of the African diaspora insofar as they were educated, stylish and confident, even if some of them were owned by white people and treated as the exotic other.” (via theguardian.com) Thus, through recreating the portrait, Diop investigates his own cultural heritage and gives figures omitted from history a voice once more, as well as celebrates them, as despite existing “at a time where it was very unlikely for them to flourish – during colonisation and slavery.” (via trueafrica.co) they managed to lead a successful life. Diop achieves this through restaging the original portrait, wearing a near-identical costume and recreating the composition and colour scheme of cool shades of blue and white, which create a sense of harmony and balance. However, the portrait is not exactly copied in Diop’s piece, merely appropriated. It is readily recognisable, however, the works in Diop’s series all have a modern-day narrative through references to football. In Albert Badin, these are a whistle and a red card which replace the original work’s chess pieces. Curator Raquel Wilson has stated the use of football equipment demonstrates the “duality of living a life of glory and recognition” while simultaneously confronting the “challenges of being ‘other'” (via omarviktor.com). Modern African players achieved recognition in Europe, yet face still racism, similarly to Badin. Diop states that this is the “kind of paradox I am investigating in my work.” as “there is a very interesting blend of glory, hero-worship and exclusion.” (via theguardian.com). The use of football equipment in Diop’s works ties together racism in both the past and present. In terms of formal qualities, the work mimics and appropriates the original portrait. Diop has a near identical angled tilted head, however, the original portrait is titled to the left whereas Diop turns to the right. 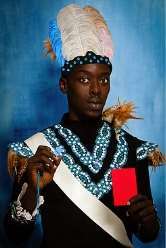 Diop wears a similar costume and pose, as well as facial expression: both figures have eye-contact with the viewer in a confrontational, yet playful and manner, as if the figure were challenging the viewer to a game of chess or- in Diop’s work- presenting the viewer with a red card and whistling at him. In football, this means that the player has to leave the field. This could be representative of Diop criticising the viewer and indeed society of omitting Badin from history, punishing them with the red card. Modern appearance: through the high quality of photograph, the piece appears sleek and fashionable, which is to be expected, as Diop also works in fashion photography. The work is not edited to mimic the old and worn appearance of the original piece, as Diop wishes to give the piece a clear modern look. Although Diop recreates a portrait from the 18th century, there is a clear modern narrative through the aesthetics of the work and the use of football equipment. This highlights that problems Badin experienced hundreds of years ago- such as racism and alienation- remain contemporary issues today, and should not be forgotten. Symbolic form: Diop holds the whistle and red card in a staged manner, allowing the viewer to clearly see the objects. The viewer’s eye is drawn to them, indicating their importance. Head turned to right: Diop does not exactly replicate the original portrait, although the overall composition is near identical. Head turned to left: one of the key differences between Diop’s work and the original portrait. Chess pieces: Badin hold chess pieces, representing his intellectual as well as playful and entertaining personality. 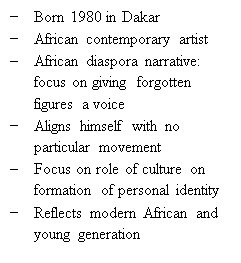 As mentioned previously, Diop gives African historical figures omitted from historical discourse a voice who Diop states “ought to be celebrated” (via trueafrica.co) and forces the figures into a modern narrative once more. Diop himself belongs to the modern generation of young, successful Africans who chose not to abandon their country, despite being presented the chance to: Diop’s family is in the upper middle-class and Diop studied and worked in Europe for many years. Thus, contemporary issues relating to Senegal and the African continent influence his work greatly. The portrayal of Africa in often a negative one, featuring nothing but poverty and generalising the large and diverse continent to nothing but stereotypes. In depicting successful African figures who were forgotten in historical discourse, Diop reminds the viewer of the complexity of African history and culture, and speaks against and challenges the negative representation of Africans in popular culture. Furthermore, Diop explores what it means to be a part of modern Africa, and investigates how history influences both personal and collective identity. Through confronting the viewer with historical figures- perhaps in a damning way, represented through presenting the viewer with a red-card- Diop forces the viewer to contemplate and reflect on African history, critically as Diop himself exhibited the series in Dakar and later in France, which has a colonial past and a large amount of African immigrants. Therefore, both the artist and the viewer contemplates the balance and interconnectedness of modern-day Africa and the rich and complex African diaspora. Caricature of stereotype: In this work, Sherman takes on the role of a middle-class woman, which is indicated by her tacky jewellery and costume, on vacation, shown by her intense sun-tan. 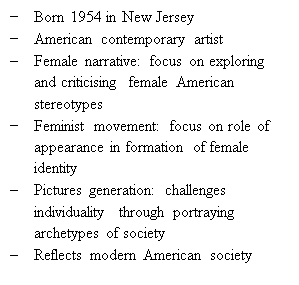 Thus, Sherman handles a multitude of stereotypes in the work: Americans, women, and the working-class. The work analysed is Untitled (Self-Portrait with Sundress), however, while researching, it was found that sources have also titled the piece Untitled (Self-Portrait with Spraytan). In this study, the former will be used according to the auction site artnet.com, which was deemed a reliable source. The piece was created in 2003 and is a chromogenic print on smooth white paper with full margins, and 66 * 40 cm. The work is a part of Sherman’s early 2000s series of self-portraits, which feature Sherman in different costumes and poses, portraying female stereotypes in American film, television, and advertising. Through the medium of photography, Sherman mimics reality and constructs new identity: a persona. In doing so, Sherman criticises the subject and role she takes on. In the case of Untitled (Self-Portrait with Spray Tan), Sherman critiques American society for its superficiality and consumerism as well as banality. As with most of Sherman’s work, it is a self-portrait, in which Sherman uses makeup, costume, and props to depict a common American stereotype and visually and socially-defined personality type. Sherman is barely recognisable and easily changeable as she depicts an intensely tanned subject in a sundress. The subject is posed in an unnatural manner, and her features are exaggerated, thus creating a caricature. The work forces the viewer to confront and reconsider stereotypes through. Sherman does not define where she stand in relation to he works, and the interpretation is left open to the viewer. Ultimately, the reaction of the public to her work says more about the viewer than the subjects themselves. Sherman has played a major role in various art movements, each of which are reflected in the piece. Feminist movement: Emerging in the late 1960s, the movement sought to criticise and change the world through art, with a specific focus on women and their roles in society over a longer period of time, being the nineteenth to twenty-first century. Sherman, as other feminist artists, include the female perspective in their works and question the social landscape of their context. She explores femininity as a social construct and examines female typologies. In Untitled (Self-Portrait with Sundress), Sherman takes on the role of the stereotype of a sun-tanned, middle-class American woman on vacation, with a so-called ‘cheap’ appearance. Through creating this character, Sherman explores the role of appearance in the formation of identity, particularly female identity. Thus, Sherman reworks archetypes as both a creator- and woman- and character. She re-establishes women and what it means to be a woman in today’s world, and freezes herself in the role she takes through the medium of photography. Thus, the works are both deeply personal and feminist. The Pictures Generation: This label often refers to both contemporary artists and specifically visual artists active in the seventies and eighties. Critically, the artists use appropriation and montage, as well as explore the constructed nature of images through the medium of photography. As with Sherman’s work, members of this movement often seek to trigger social criticism in viewers saturated by mass media. Indeed, the artists themselves were heavily influenced by the saturated image culture of the United States, and thus, the works challenge traditional art forms and mimic the artificiality of media and in particular advertising. Works appear mass-produced and blur between fine art and popular images, as they are composed with conceptual frameworks. Sherman specifically explores the boundaries between original and fabricated reality through an exaggerated appearance with a clearly staged environment and printed the photographs in large-scale and bright colours, yet the works are clearly inspired by reality. This creates a blend of performance and photography itself. Formal qualities: Whilst both works share the medium of photography and are self-portraits, the subjects portrayed are vastly different. Both Sherman and Diop take on personas which differ greatly: Sherman poses as an American sun-tanned woman, Diop is a historical figure. Both artists appropriate to some extent. Diop directly mimics a historical portrait, whereas Sherman imitates a specific archetype. The subject is easily recognisable, and thus leads the viewer to question the role of appearances in the formation of identity, and how appearances can or cannot be misleading: does the fact that the artists dress up as a figure mean they are the figure? As the works are self-portraits and the subject is the artist themselves, there is undoubtedly a strong personal link to each work for the artist. Furthermore, both works have a strong element of artificiality. The photographs are staged and feature the subject in exaggerated costume and makeup, and are not designed to be an accurate reflection of reality. However, Sherman deliberately creates a caricature of the subject, whereas Diop recreates a historical portrait with added football props, carrying a symbolic meaning. Function and purpose: Critically, Diop explores the paradox of modern and historical identity, as well as the role of history in the formation of contemporary African identity. Through posing himself as Albert Badin and the use of football symbolism, Diop’s work investigates the link between our culture, the history of our homeland, collective and personal identity of Africans. Contrarily, Sherman’s work does not have a focus on history, and instead focuses solely on modern American society and how this influences the personal identity of women. Cultural significance: In terms of cultural significance, the two artists share little to no similarities. However, critically, both artists reflect their own cultural context through their works: Sherman mirrors American stereotypes whereas Diop explores the contemporary question many young Africans face today, being balancing cultural history and modern identity. 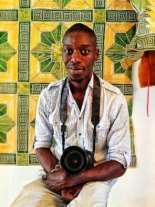 "Photographer Comparison Essay: Cindy Sherman and Omar Diop." UKEssays.com. 11 2018. All Answers Ltd. 04 2019 <https://www.ukessays.com/essays/photography/photographer-comparison-essay-cindy-sherman-omar-7620.php?vref=1>. "Photographer Comparison Essay: Cindy Sherman and Omar Diop." All Answers Ltd. ukessays.com, November 2018. Web. 23 April 2019. <https://www.ukessays.com/essays/photography/photographer-comparison-essay-cindy-sherman-omar-7620.php?vref=1>. UKEssays. November 2018. Photographer Comparison Essay: Cindy Sherman and Omar Diop. [online]. Available from: https://www.ukessays.com/essays/photography/photographer-comparison-essay-cindy-sherman-omar-7620.php?vref=1 [Accessed 23 April 2019]. UKEssays. Photographer Comparison Essay: Cindy Sherman and Omar Diop [Internet]. November 2018. [Accessed 23 April 2019]; Available from: https://www.ukessays.com/essays/photography/photographer-comparison-essay-cindy-sherman-omar-7620.php?vref=1.